Christmas Card, signed ‘George II R’ as King of Greece. 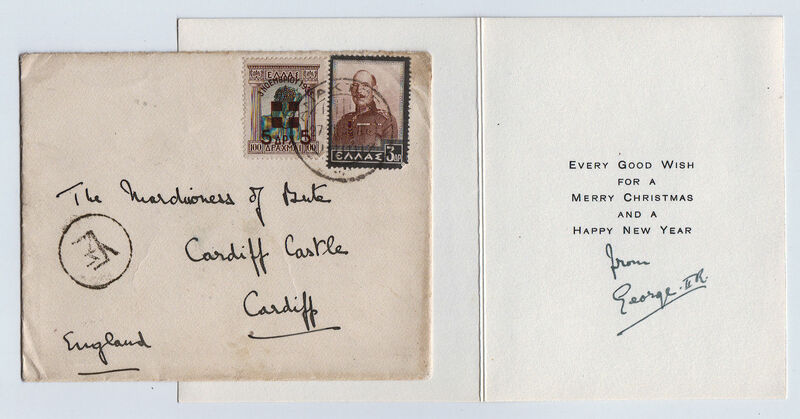 Pictorial card 5 x 4 inches, fine, with the original envelope, franked with Greek stamps, addressed to the Marchioness of Bute at Cardiff Castle, royal monogram handstamp. Postmarked 27 November 1936. George II (1890 – 1947) reigned as King of Greece from 1922 to 1924 and from 1935 to 1947.